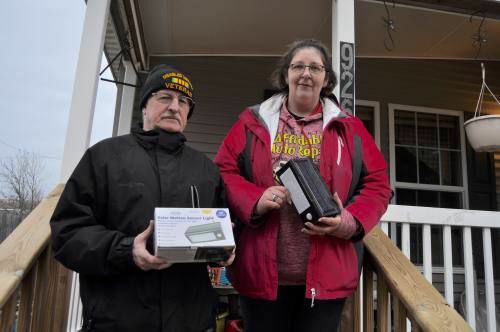 Lincoln Area Neighborhood Watch volunteers Julie Theobald and Jack Baughan have been passing out motion sensing lights to interested residents to help reduce dark areas where criminal activity can occur. CADILLAC — No better proof exists as to the effectiveness of community-based policing than the transformation that has occurred in the Lincoln Elementary School neighborhood on the northeast side of Cadillac. At least that's what police and residents of the area claim, and they have the proof to back it up. It was summer of 2015. Several people in the area approached the Cadillac Police Department and Cadillac City Council to ask what it would take to start a neighborhood watch program. “I have major safety concerns,‘ said Sundberg Street resident Julie Theobald, who at the time was so worried about crime that she started locking her doors — something she never used to do. Neighborhood watch programs had been established in areas throughout the city years ago but eventually disbanded, due in part to decreased community involvement and the fact that the police department didn't have an officer dedicated to administering the program. 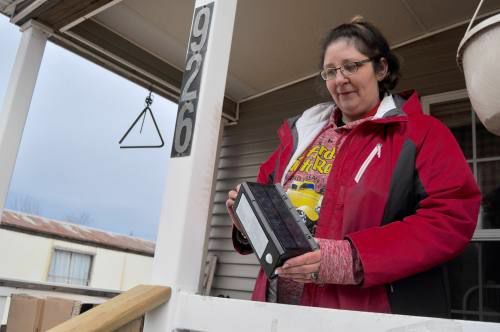 It took some time for the police department to research a new program and figure out a way to implement it but once all the pieces were in place, the Lincoln Area Neighborhood Watch hit the ground running and never looked back. On the third Tuesday of every month, like clockwork, program organizers have met with their neighbors to discuss a variety of matters, including crime, blight control and how to make the neighborhood a better place to live. Cadillac Police Officer Jeff Rork helps oversee the program, along with several other community policing initiatives through the Cadillac Community Partnership. Rork said the Lincoln Area Neighborhood Watch has been a resounding success. Although he was hesitant to cite exact statistics because there are many factors that contribute to why crime rates go up or down, Rork said he believes there have been more service calls in the area and less overall criminal activity, which is an ideal type of situation. Compared to 2015, Theobald agrees there isn't nearly the same amount of criminal behavior occurring in the area. "A couple years ago, you could see people walking down the street — obviously high on drugs — and people didn't say anything about it," Theobald said. "That doesn't happen anymore. People aren't afraid to speak up. They don't let it slide like they used to." It isn't just crime that has been affected by the program, Theobald said, adding people seem to have more pride in their neighborhood and its beauty. "I've never seen so many Christmas lights up than we had last year," Theobald said. Several other neighborhood watch programs started up in different areas of town after the community-based policing initiative was implemented, but the Lincoln Area chapter is the only one that has remained active, and in fact, seems to be picking up steam, Rork said. Part of the program's success has been the community embracing the idea that a neighborhood watch isn't intended to be a patrolling gang of nosy do-gooders, Rork said. Rather, the intent is for community members to get to know and care about each other, recognize when something odd is going on, and notify police when they suspect crimes are taking place. The program's success in stopping crime has been documented: In September of 2016, a neighborhood watch member called police about suspicious activity that turned out to be a drug deal in progress. But crime prevention is only the tip of the iceberg. When a community member needed a new shed but didn't have the resources to build it himself, the neighborhood watch organized a fundraiser and several residents donated their time and skills to help build the structure. Blight control is another huge improvement made possible with help from the neighborhood watch. In the past, it wasn't uncommon to see car parts, torn-up furniture and trash littering front lawns of homes in the neighborhood. With a healthy dose of pressure from the neighborhood watch and the police department, these residences have mostly been cleaned up. Success in controlling blight also was aided by the Wexford County Prosecutor's Office, which has been more aggressive in pursuing blight cases, Rork said. The most recent project being undertaken by the neighborhood watch is the installation of motion sensing lights in dark areas of the community where criminal activities could more easily be hidden. Theobald and volunteer Jack Baughan have been passing out the lights to interested residents. Baughan doesn't live in the neighborhood but his children attended Lincoln Elementary School, which is why he started volunteering. From the outside looking in, Baughan agrees with Theobald, Rork and Elmore that the neighborhood watch seems to have made a huge impact on the community. He believes in the program so much that he fronts the money they use to purchase the motion-sensing lights, and helps residents who can't afford a light get one on a payment plan. For information on the program, check out the Lincoln Area Neighborhood Watch on Facebook. The monthly meetings are held the third Tuesday at 7 p.m. at Lincoln Elementary School.